Whip up something wonderful with our charming Heart Handle Whisks. 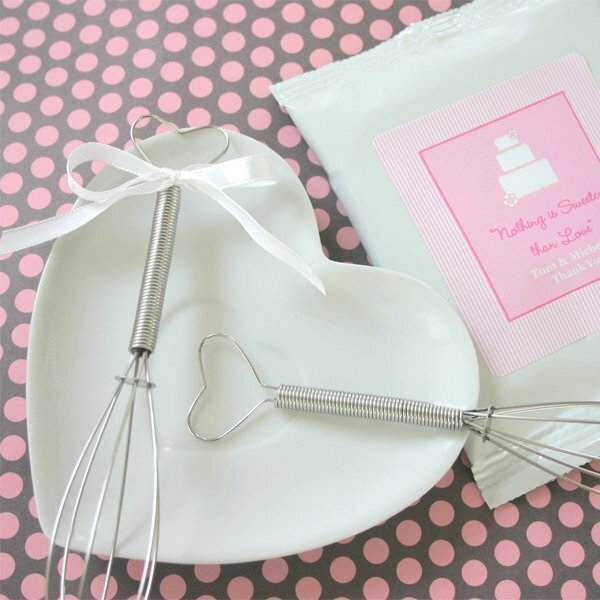 Perfect for a wedding or baby shower, each whisk has a heart-shaped top and white satin bow making them a unique and beautiful favor. Pair with one of our personalized drink or sweets mixes like cocoa, lemonade or muffin mix (sold separately). Long after your special day is over, this favor will stay in the hearts and homes of your friends and family. Measures 5.75" in length. I am looking at the heart shape handle whisks. Does the favor include the heart shaped class dish? What size in inches are these whisk? The Heart Shape Handle Whisks measures 5.75" in length. Each whisk has a heart-shaped top and white satin bow making them a unique and beautiful favor. Hi, in the wedding shower favor photo of the heart shaped kitchen whisk, there is a small ceramic heart dish. Do you have those for sale? We don't sell that exact heart dish shown in the photo, as it is only for display but we do have Heart Shaped Ceramic Plates (Set of 4) which can be found here.